…. 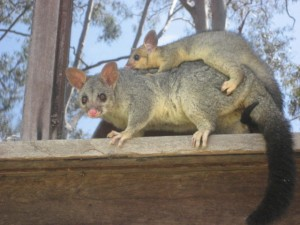 Mother possum with a little baby possum …. One morning a few years ago I was in my office. My wife had gone to work and I heard a little sound out in the front arbour area. I went out and here was a little baby possum on the brick paving at the front door. I realised he must have fallen down from his mother who slept up in the outside /\ of the top projecting ridge beam. I picked him up and placed him on one of the arbour vines with the hope he could back up to his mother. I went back to my office and soon heard a bigger sound. I went back out and here was the mother possum down on the paving getting the baby onto her back. She climbs up one of the the arbour vines to reach a 50 mm wide timber edge on the front /\ window. She walks along this ledge for a 2.00 metres then turns around and starts going the other way. The bush trees are reflected in the glass so run in and get my camera and get this photo. In 1981, we built a unique natural house which people often come out to see. This is on our five acres of light open eucalypt bush at Chambers Flat, Brisbane which is 35 kms. out of Brisbane. The house is largely of glass set into a post and lintel construction of 100-year old broadaxed timbers and sandstone walls. The total concept of indoor-outdoor flow has a nice ambiance to it and the design is unique. Harriet and I are into simplicity and recycling. We live in this amazing house built out of rejected materials for minimal money 34 years ago from 2015. We spent some money of our own on internal things the builder hadn’t allowed for in his costing eg. stone wall construction, glass in the upper apex of the house and brick paving on the floor in flowing lines etc. See the hyperlinked posts on the house and garden. 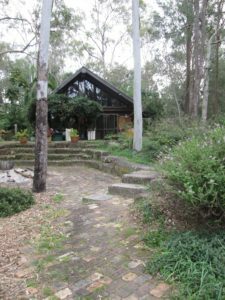 See the photos of the house and garden and the history of how we obtained rejected materials like the Supreme Courthouse stone (where the Law Courts are now in Brisbane) …. two loads for nothing in 1980. They dumped 100’s of cubic metres as fill and built a school over the top. The stone was cut out of the Kangaroo Points Cliffs in 1877. I thought of a landscape as would a sculptor in a solid medium, but I saw it as a three dimensional piece of space which people walked through which had an emotional effect on people. This space changed with time as it grew and changed with the time of day: shadows vs. sun patterns, boulders, colour, plants, trees, earth-forms, solid structures and water. These were the ingredients in a subtle flow of landscape design and construction. Unknowingly I was a landscape sculptor. Rather an intangible product to sell and run a business with!! Out of this stage I built a structure for my life: my marriage with Harriet, business and the house plus we had a family. Ponds in the garden were easily made in the initial earthworks for the house when the site was excavated in 1981 (34 years ago from 2015). Our land is is on a sandstone base four metres down below the soil surface. We have on our land about a metre of black sandy topsoil which becomes a heavy clay layer which then goes down to the sandstone base. With heavy rain, the water sinks down to the heavy clay layer and sits on top of the clay. It is like a vast underground dam and with slight southern slope of the land, this underground water slowly drains down the slope over several months. Three months later, this water is readily available at the surface if you dig a hole. Woe to you if you went down in a vehicle. The soil would turn to instant bog and you would need to be towed out by another vehicle on a firm surface (that is why we had many horizontal logs and branches laid down in our extensive driveway coming down to our house). In 2016, the house is looking well finished in the setting of the bush. Birds flit around the glass outside with strident bushland calls. Occasional wild ducks shelter beside the water filled ponds which drain thunderstorm water away from the house. In summer if water remains, blue waterlilies multiply from last years seed left in the muddy bottom when the ponds have dried up.